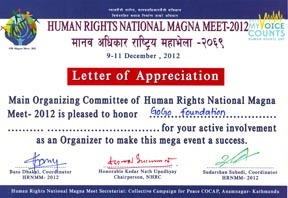 GoGo Foundation has received a letter of appreciation from the Main Organizing Committee of Human Rights National Mega Meet-2012 for its active role as an organizer to make the mega meet a grand success. The mega meet had human rights activists, practitioners and civil society activists as participants from around the country. The mega event was organized from 9-11 December 2012 in Kathmandu.